The River Damsel: They Call Him...MR. Whitefish! Have you ever had one of those days that no matter what you did, the trout ignored you??? Was it one of those days that you were glad for the persistant nymph boggler, The Rocky Mountain Whitefish??? Even though it is not as highly regarded as many other Salmonid species, it has saved the day for many anglers too proud to admit it! Well, I am here to admit that I had one of those days...When I look back at the "early" days of my fly fishing adventure...I have to remember one of my first catches at "The Box" Canyon, Island Park, ID. What a beautiful place. If you have never been there...write it down on your list. I was with a class from Salt Lake and we caravanned up to fish the weekend. I believe it was the first of November as it was getting pretty cold up there. As I was experiencing a little difficulty bringing in my first fish of the day, one of my classmates summoned me down to a sweet bend in the river where there was a lot of activity. I repeated my straight line indicator nymphing with a large bead headed nymph. (Rubber legs also work very well here.) I put my line in and it wasn't even five minutes later..."Incoming"!!! I was so excited that it didn't matter what size or type...it was a fish!!! And I loved him...that "Whitie"! Who couldn't love those fish lips!! The guys were excited for me too...then one classmate said, "Oh, a nice whitefish!!!" (sarcasticly) Yes, I thought it was! And proud of it...until...I learned later that it wasn't as desirable as the mighty BROWN trout or the beautiful RAINBOW. I had a picture with him anyway...it was a great fight, plenty of pulling and diving! And then a rainbow was caught, and very submissively. The rainbow wasn't as much fun as Mr. Whitefish in the fight to the net...and I always catch and release...so, why wouldn't I want the better fighter??? Oh, I see...He wasn't pretty enough. A lesser species of the underground world...A "trash fish" ...Poor Mr. Whitefish. Underclass citizen...He might not have that pretty pink stripe on his side or those big brown and red spots...but, he only wants to please those on the other end of the line with a fight to the end! As evidenced by their specialized subterminal mouth, whitefish feed primarily on immature forms of bottom dwelling aquatic insects. So, I guess that you could call them "bottom dwellers" and probably the reason why I hooked into a couple of them on that outing! I had a lot of weight on my line to get it down in a deep pool. And that is where they hang out in the winter...So, I started to look around on the web a bit and found an interesting video on this native fish of Idaho...check it out! There are those who have reason to applaud Mr. Whitefish...and give him the credibility that he deserves. 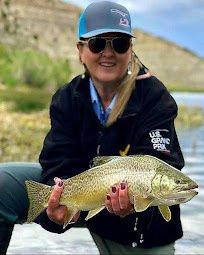 Ok...there you have it...it's not a disgrace to catch a Whitefish...Now, about "The Box" Canyon...there is much more to this amazing fishery than finding a Whitefish! Haha. Below Island Park Reservoir the Henry's Fork flows into the famed "Box Canyon". This short 3 1/2 -4 mile stretch of river produces some of the best fishing you will find anywhere on the river. 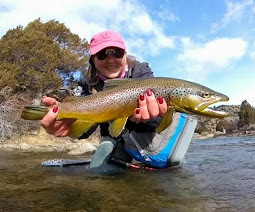 You will find trophy size rainbows and brown trout. This fast flowing section is primarily nymphing water due to an abundant food supply consisting primarily of stonefly nymphs. Oh, you know that is my favorite type of fly fishing! Then, there is the beauty of the Targhee National Forest and the many lodgepole pine and Douglas-fir. This is not the typical waters of the Henry's Fork of the Snake...You will see rapids, pocket water, swift, rocky flats and fast, boulder-filled runs. If you want the famous dry fly fishing...that will be a few miles down river. The sun had moved behind the trees and I began to realize how remote this place was. My only companions were a couple Bald Eagles nesting in a broken pine across the river. I had a good day. The scenery is absolutely breathtaking! And peaceful. For sure, this is one place that should be put on your fishing bucket list. And if you see Mr. Whitefish up there, tell him "Hi" from RD...until I get up there again...which will be the fourth time? Oh, who's counting anyway... : ) Ahhh...looking forward to catching a pig (oink oink) on 4x tippet and feeling that rod almost being pulled from my hand! 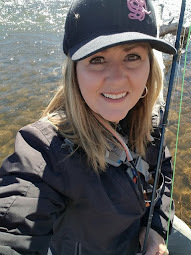 i learned a long time ago that all species of fish are wonderful and some of my most favorite days on the water were not spent fishing salmon steelies and trout, but rather chasing rough fish! 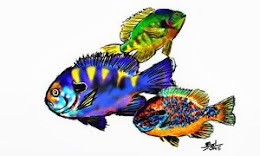 I think that most people who fly fish have a first fish that is a "junk fish." Mine was a sunfish and I still sometimes go back to that hole and catch sunnies just for kicks. Who care's as long as you're having fun? The Box is the best! It's a different experience each time you go too... Anthony ~ Fun is where it's at...And I haven't seen another "whitie" there the last two times up...beginner's luck, I guess! I've caught bats on my backcast...I'm hunting owl next time I get out. Maybe someday if he works really hard Mr. Whitefish can acheive a better life status like Mr. Carpfish and Mr. Garfish have..... This could be a good idea for a childrens book. Mr. Whitefish builds some self esteem Hummmmm! Sometimes those alternative species can save you from a skunking, and are often just as much fun to catch. There have been times I went after smallies only to catch sunnies, and I was thankful for them. Cofisher ~ There you go again about bats...I will be so disappointed if I don't see one when I come out there! Kevin ~ Ya know, the Unaccomplished Angler might like to do a book on the subject...Are you listening out there Kirk?? I'm down with your whitefish. We've got fallfish back where I live, same deal. Most think they're trash fish, I just look at it as additional action.